I knew I had to focus on increasing my weekly mileage. Reducing the number of rest days would also develop my leg muscles quicker, although I had to be careful due to a recent minor injury. I believe I found a productive balance. On Friday (20 April) I wanted to test myself over a distance that was close to 10 miles. I had doubts that I would find it comfortable. I chose 8 miles and, although I started strong, I did not expect to be particularly consistent. But I was. The miles seemed to fly by and I was pleased to finish, knowing that 10 miles would not be difficult to cover in a few weeks’ time. Although I have not demonstrated my race pace for an extended period I ran five days in a row, building my mileage sensibly by running some at an easier pace. My legs did ache at times but not enough for me to worry about injury. 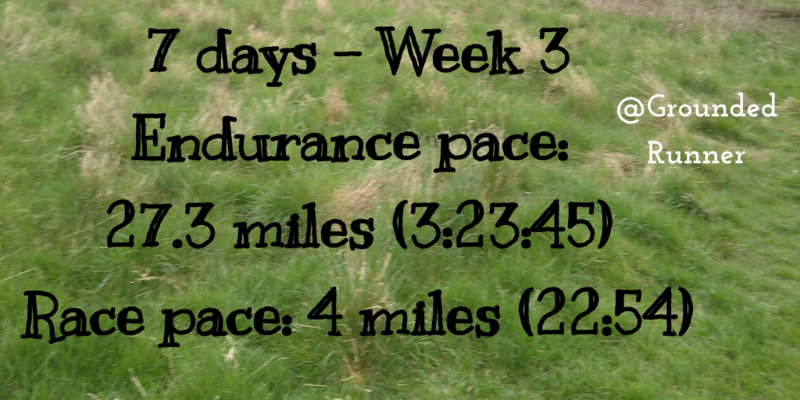 This proved that my endurance is progressing and I am still on track for my future running goals. Psychologically the ‘long’ runs were a boost. I ran my only interval workout on Monday (16 April). I ran 4x 1 mile at race pace* with 3:30 walking recoveries. Only the last mile rep fell below my race pace but the I feel I met my target. However, the interval workout was challenging. Each rep was two laps around my local park, and after the first minute of each rep my effort level increased significantly. Despite the consistent pacing I was clinging on at the end of the reps.
My One Mile Challenge taught me that although grass is a kinder surface than road for bones and ligaments, a runner has to work harder to generate the same power from the ground. This means that for speed workouts the pace can be lower than expected. I knew I was hitting my target pace because I allowed for this. So rather than be disappointed I was satisfied with a tough workout. Excluding the interval workout I accumulated over 27.3 miles during the week, of which 12 miles were ran at less than a minute slower than race pace**. The remaining miles were run at a comfortable endurance pace***. My only rest day was Tuesday. * The race pace I am still hoping for is 6:00 per mile. ** This is equivalent to a pace of 6:30-7:00 per mile. *** This is equivalent to slower than 7:00 per mile pace.